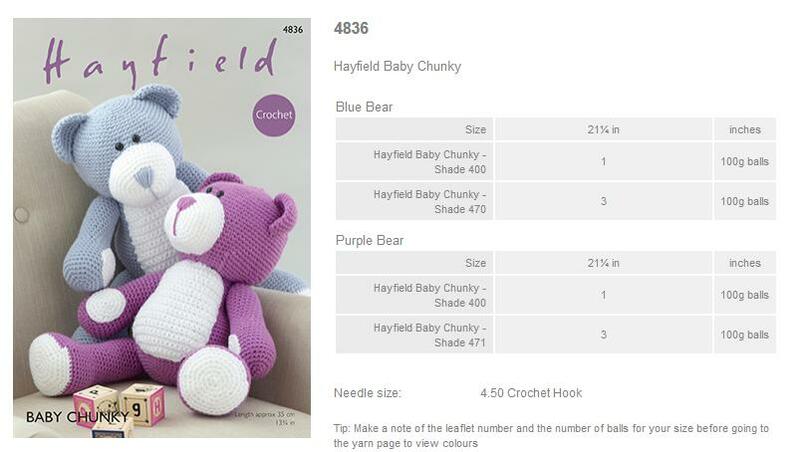 4836 - Bears using Hayfield Baby Chunky Leaflet with designs for Bears using Hayfield Baby Chunky. 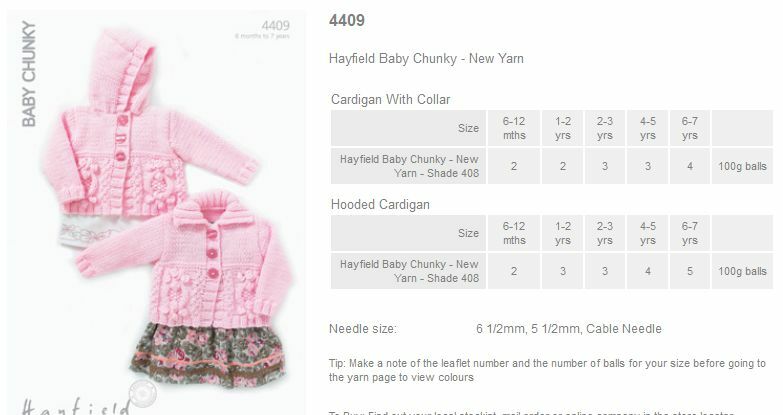 4409 - Cardigan with Collar and Hooded Cardigan using Hayfield Baby Chunky Leaflet with designs for a Cardigan with Collar and a Hooded Cardigan using Hayfield Baby Chunky. 4408 - V Neck and Round Neck Sweaters using Hayfield Baby Chunky Leaflet with designs for V Neck and Round Neck Sweaters using Hayfield Baby Chunky. 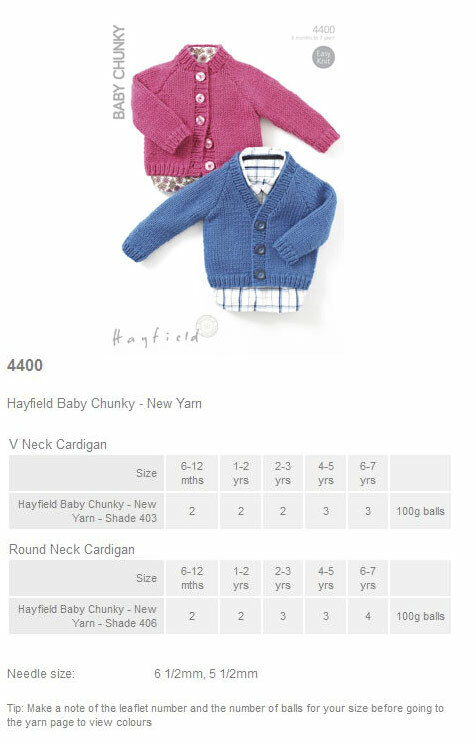 4407 - Round Neck Cardigan, a Collared Cardigan, and a Hat using Hayfield Baby Chunky Leaflet with designs for a Round Neck Cardigan, a Collared Cardigan, and a Hat using Hayfield Baby Chunky. 4406 - V Neck Cardigan and a Shawl Collared Cardigan using Hayfield Baby Chunky Leaflet with designs for a V Neck Cardigan and a Shawl Collared Cardigan using Hayfield Baby Chunky. 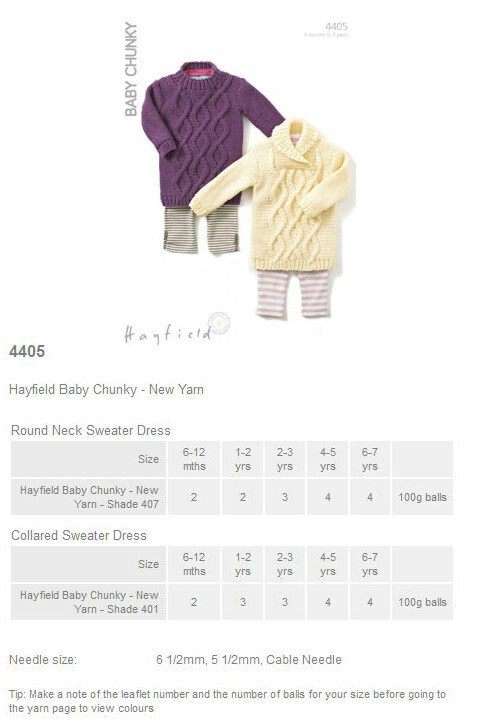 4405 - Round Neck Sweater Dress and Collared Sweater Dress using Hayfield Baby Chunky Leaflet with designs for a Round Neck Sweater Dress and a Collared Sweater Dress using Hayfield Baby Chunky. 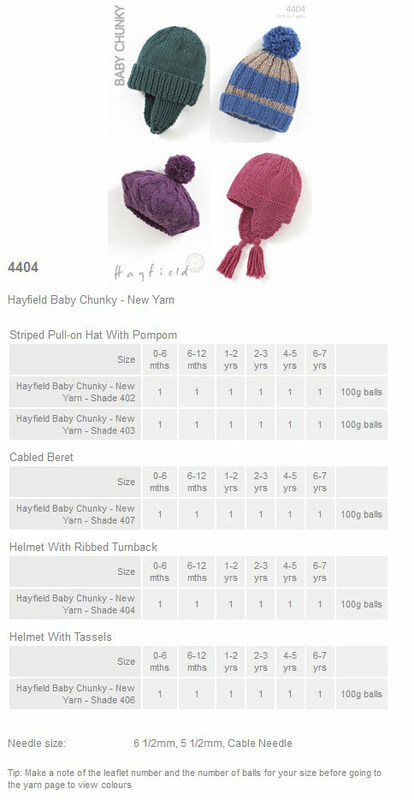 4404 - Various Hats using Hayfield Baby Chunky Leaflet with designs for a Striped Pull-on Hat with Pompom, Cabled Beret, a Helmet with Ribbed Turnback, and a Helmet with Tassels using Hayfield Baby Chunky. 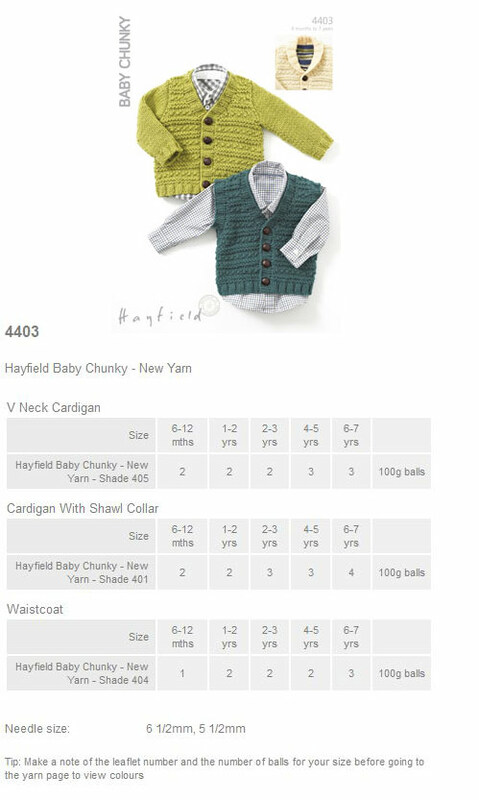 4403 - Cardigans and Waistcoat using Hayfield Baby Chunky Leaflet with designs for a V Neck Cardigan, a Cardigan with Shawl Collar, and a Waistcoat using Hayfield Baby Chunky. 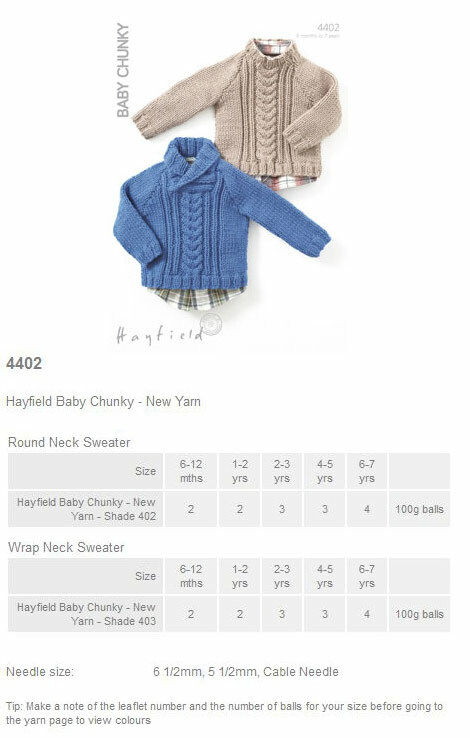 4402 - Round and Wrap Neck Sweaters using Hayfield Baby Chunky Leaflet with designs for Round and Wrap Neck Sweaters using Hayfield Baby Chunky. 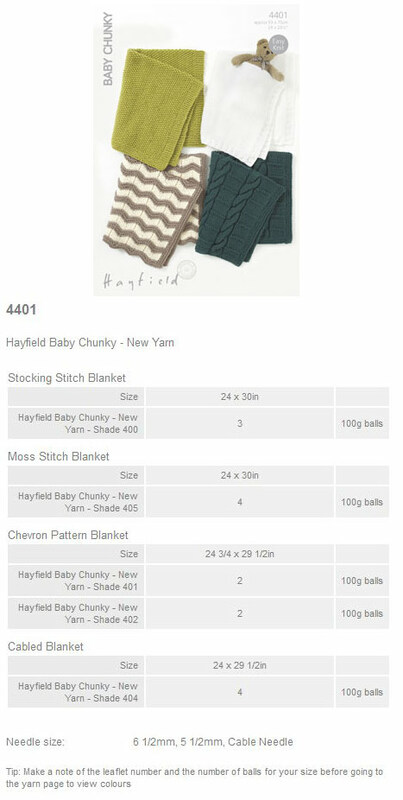 4401 - Vaious Blankets using Hayfield Baby Chunky Leaflet with designs for a Stocking Stitch Blanket, a Moss Stitch Blanket, a Chevron Pattern Blanket, and a Cabled Blanket using Hayfield Baby Chunky. 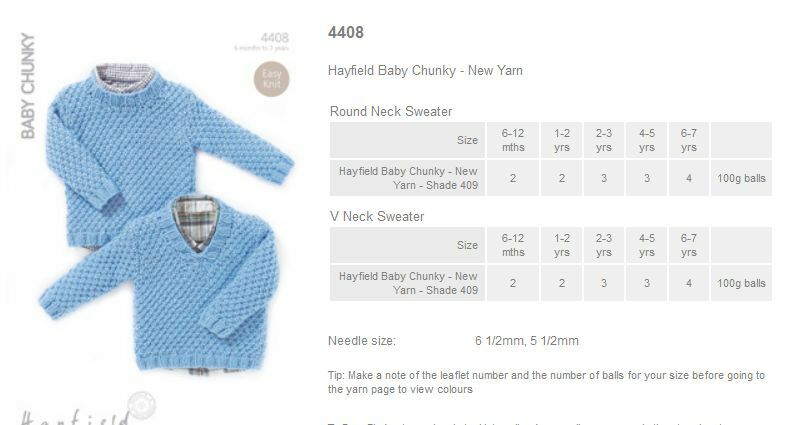 4400 - V Neck and Round Neck Cardigans using Hayfield Baby Chunky Leaflet with designs for V Neck and Round Neck Cardigans using Hayfield Baby Chunky. 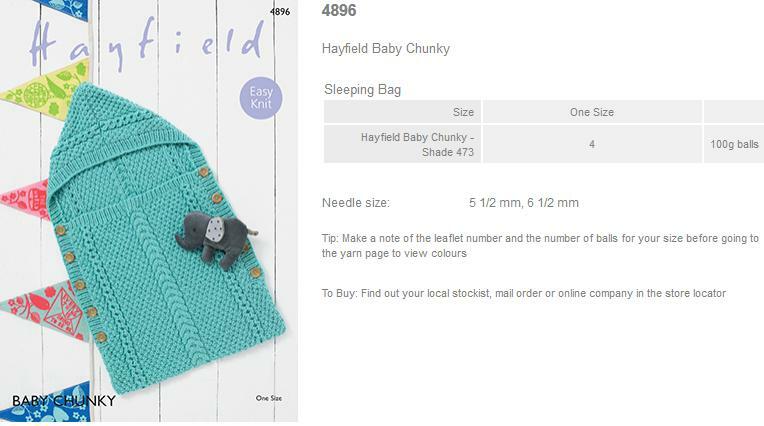 4896 - Sleeping Bag using Hayfield Baby Chunky Leaflet with a design for a Sleeping Bag using Hayfield Baby Chunky. 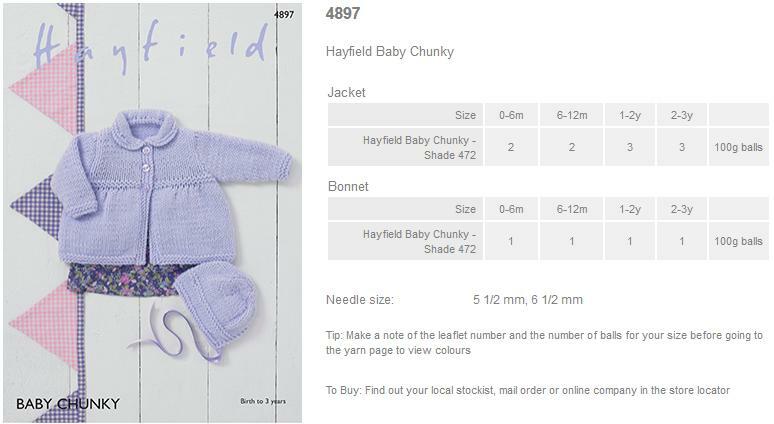 4897 - Jacket and Bonnet using Hayfield Baby Chunky Leaflet with designs for a Jacket and Bonnet using Hayfield Baby Chunky.